Noizio is an app that will drown out the noise of the street and allow you to concentrate on the work at hand, increasing your productivity. On the other hand, it can also set the mood for a romantic evening or lull you to sleep, ensuring that you will dream soundly all night long. 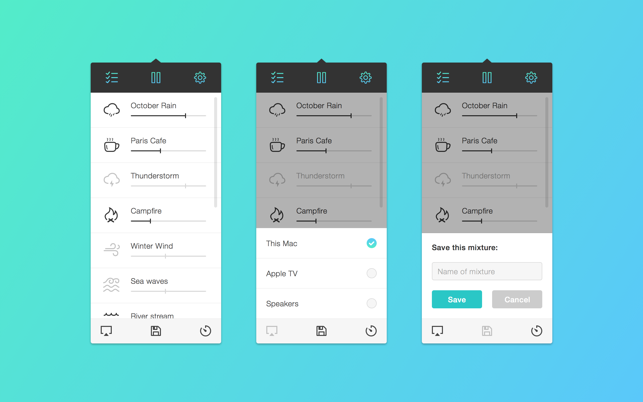 An ambient sound equalizer app for creating a mixture of ambient sounds available for iOS. • Background sound support. Listen to your mixes while using other apps. 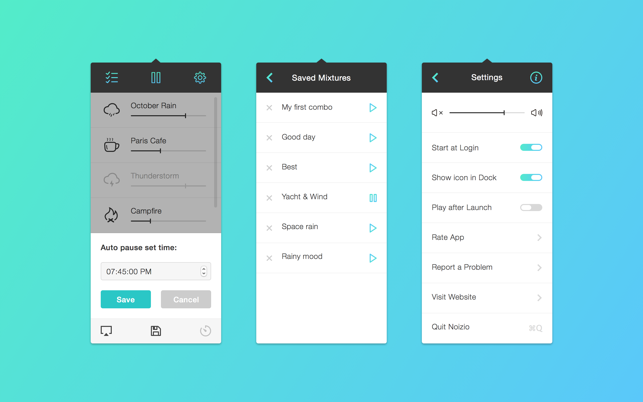 • The Noizio app lets you play all of the sounds offline. October Rain, Coffee House, Thunderstorm, Campfire, Winter Wind, Sea Waves, River Stream, Summer Night, Sunny Day, Deep Space, Sailing Yacht, Inside Train, Farm, Wind Chimes, Blue Whales. Download noizio Now to get a simple yet elegant instrument for setting the right mood for any occasion. Use it to help you work or study, or allow the sounds of this app to transport you to a cozy camp fire under a full moon or to any other place you can imagine. I like this app, because it attempts to be a Noisli copy that lives in your menu bar, which is what I wanted. The issue with it is that the save feature doesn’t work (at least for me, and I’m on macOS Sierra). Every time I restart the app, I lose those saved mixtures. I contacted the developer about either getting me a refund or just letting me know if there was fix coming soon, and I never got any response (it’s been a couple of weeks). Also, the sound sample aren’t as good as Noisli in my opinion. The coffee shop has an annoying dish clashing sound that is more interuptive than anything else; the train has a bunch of higher pitch noises that aren’t nice either (something rattling, and the wheels squeaking); someone has already mentioned the plink in the rain sound. All 3 sounds might be realistic, but they don’t make for good background noise. So although the interface looks really good and works well (apart from the save feature), this app just isn’t worth it in my opinion. Especially when Noisli and Sleep Pillow are both free, where as this app costs $5 currently. UPDATED review, for 1.6.2: So much work on the app by the developer, who writes, “Fixed old bugs,” but the “plink” sound is _still_ there? Such an easy fix, it seems almost user-adversarial that they keep leaving it in. So my older review still stands: It’s a good simple app, worthy of five stars… at least it would be, if the developer removed the “plink” sound from October Rain. It would be easy to do, which I know for a fact since I just did it. Let me be specific: October Rain’s sound file is called 2_sound_rain_1.caf, and it’s just over a minute long. Its length is fine, except for a very noticeable sound around 22 seconds in that gives away the loop every time. It took me less than a minute to go into the sound file and remove this plink. So I know, technically, scientifically, that it’s not too much to ask for the developer to do that work. Do that and I’ll give the app the five stars it deserves otherwise. I do like this application. It helps “drown” out some of the background noise. A background noise option would be awesome. Use the microphone to listen to what’s around and play the opposite tones to cancel them out. Not the easiest thing and would require some processing, but doable. Anyway, my one complaint: The application currently Prevents your Mac from going to Sleep. This has caused my machine to over heat when I forget to exit the application before closing the lid and going home for the day. You can see which applications Prevent Sleep by opening the Activity Monitor and going to the “Energy” tab. There is a column with Yes/No for each application that will Prevent Sleep.